SabrangIndia team has just received information from the ground that Dina Batra, a resident of Khambesi village of Niyamgiri has died reportedly after security guards at the mining giant Vedanta’s Lanjigarh refinery and Lanjigarh (Odisha) police charged villagers with lathis. The villagers in the area were protesting outside Vedanta’s Lanjigarh refinery demanding jobs as they alleged they had lost livelihoods after losing their lands due to Vedanta’s interventions in the area. The mining giant Vedanta has, for several years, eyed the mineral rich region of the Niyamgiri mountains in Odisha’s Kalahandi-Raigarh district. As protests against the mining project that Vedanta wanted to implement, mounted, the Supreme Court of India passed an order to conduct gram sabha hearings in 12 affected villagers. All the gram sabhas unanimously voted against the company. However, Vedanta has continued in its onslaught and exploitation of the natural resources in collusion with the state machinery. Just days ago Lingaraj Azad, convener of the Niyamgiri Suraksha Samiti (NSS) of the Niyamgiri movement was arrested on charges of being a Maoist just because he joined the protest on March 5 by several Adivasi-Dalit-Bahujan groups and forest dwelling communities. The people were protesting against the Supreme Court order that threatened their existence. Lingaraj Azad had joined the protests with bows and arrows. After protests against his arbitrary arrest he was released on bail on March 12. Villagers are waiting outside the gate with the dead body. Section 144 of the Indian Penal Code (IPC) has been imposed in the area. There are likely to be more casualties. 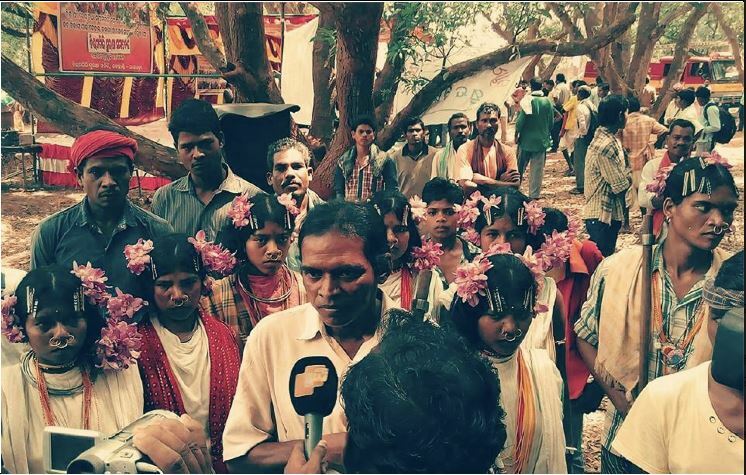 Intimidation & Illegal Incarcerations of Adivasis: Odisha Police Acting at the Behest of Vedanta?